I am project manager at Somya Translators Pvt. Ltd in India. I mostly get questions from the translators and clients what kind of project can you translate and how can I get entry into a particular domain for translation in the linguistic industry for language translation, so I would like to write FAQ‘s with answering for you all. If there is something you have to know about this topic then feel free to leave questions in comments. Q. What exactly do you do in Translation Company? Ans- It is not easy to say in short. 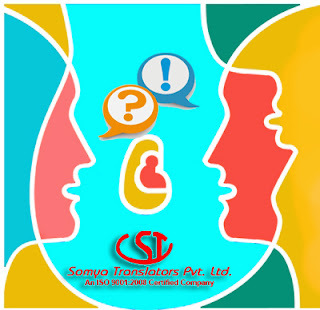 As I have mentioned above I am project manager at Somya Translators Pvt. Ltd. A project manager is responsible for successful delivery of a project ‘on schedule, within the budget, and according to previously agreed quality standards with the Clients. In the translation profession, a large project requires many translators. This increase the risk as well as cost on a project. Thus a project manager will be required to plan the budget and track the workflow to make sure its outcome will meet the client’s requirements. Q. Can a translator translate any kind of translation project? Ans- Kind of...but not every project. Let say’ if there is a video game project to translate. Every translator can’t do translation of video game due to the technical terms used in video game project. There is wide variety of technical words and material. Game translation is a complex and still trial work. If you got a work for game translation than you must aware of it that, words in games work on three different levels: the software/hardware level (files/memory units/controllers), the game metaphor level ("items", "rooms", "levels") and the narrative layer ("Sorry Mario, the Princess is in another castle"). A general translator can translate general documents like, Conversation, certificate translation, proposals, business correspondence, instruction manuals, iPhone apps, and more. Q. How many words do your translators translate every day? Ans- It’s totally depending on the projects, type formatting and experience of the translator. Generally our translator translates in between 2500 to 3500 words in a day. Q. What should a good freelance Translator do? Ans- Reply mails promptly, especially when project managers are looking for availability. Check in with project managers alternatively. Q. What types of files should I send? Ans- Our server currently accepts files in .doc, .docx, .pdf, .rar, .txt, .wpd, or .zip formats. What is translation project delivery TAT (Turnaround Time)? • Over 2,000 words - 1,500 words per day. Q. What about the Large projects having more than 1, 00,000 words? Ans- Obviously yes, we have done lots of project related to game translation, Medical Translation, software translation, legal translation etc. with successful delivery in the time frame. We use up to 20 translators in the meantime, and have supervised projects that required an output of 50,000 words in a day (approximately 200 pages per day).